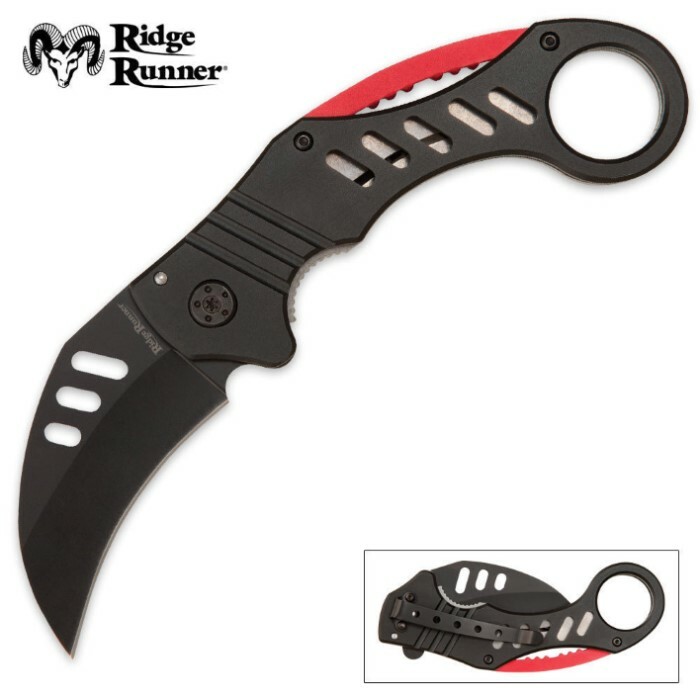 Ridge Runner Folding Karambit | BUDK.com - Knives & Swords At The Lowest Prices! 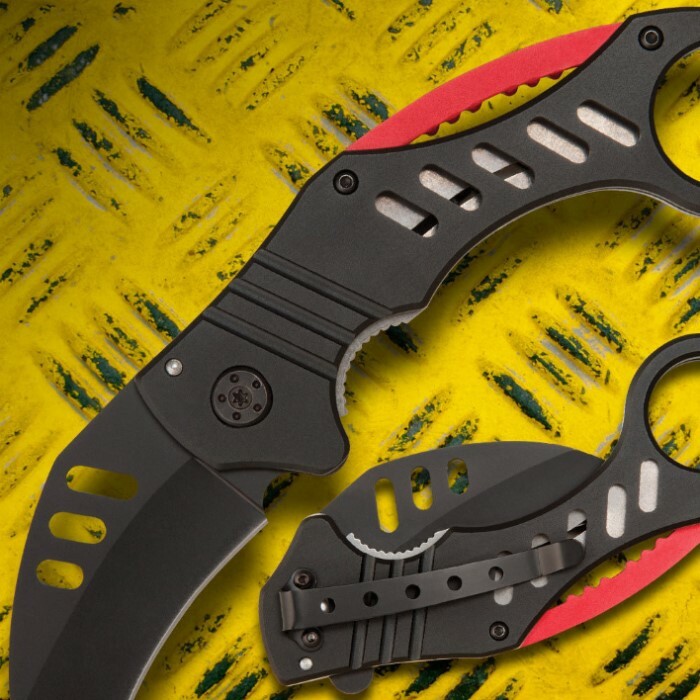 When you need an easily concealed but quick-access defense weapon, this Ridge Runner folding karambit is your answer. This karambit features a black-coated stainless steel blade with a durable aluminum handle, complete with a pocket clip for added convenience. The large finger hole will provide a great grip in any situation. It's a little stiff but can be fixed by loosening a screw. Works well. I guess i can't complain too much but after 2 weeks the knife began to fall apart. The blade got to the point where it had so much wiggle room that when I closed it, the tip would miss the slot and stab into the palm of my hand... not fun. But if for some reason you NEED a folding karambit for a week then why not. I recently developed a bit of love for the karambit, and this was the knife I odered as a starter. I would recommend keeping a small screwdriver kit for when the screws loosen (and they will, but very easy to fix). When taken care of, It even makes it into my everyday carry lineup. The blade can be sharpened to very sharp. Well more worth the money I paid for it. Can't be beat for the price. Once sharpened it holds and edge. The blade is large and will cut almost anything. My only complaint is you have to open the blade quickly or the liner lock will not engage, with the sharpness and size of the blade good way to lose some fingers. I love this knife I use it a lot . It is a cool knife to own. This karambit has a nice weight and looks really good. The blade needs a bit of work as it comes dull. It doesn't get really sharp but it gets sharp enough. Around the finger grip it could use a bit more support but it isn't going to fall apart or anything. Finally, you have to tighten the side a bit every now and then but you can easily tighten it with no tools since the screw is big and easy to grip. I wouldn't pay a ton of money for the knife but it is definitely a good deal for $6. This is the first Karambit I've ever bought. It opens really smooth and has a nice weight to it. the blade wasn't as sharp as I would have liked, but with a little sharpening it should be good to go. It's good for the price. it opens smooth locks secure. I like for opening boxes.